Image source: United States Library of Congress. Colorized courtesy of Algorithmia. This article continues the series running on Batangas History about the exploits of the 28th Infantry Regiment of the United States Volunteers1, assigned to different towns of Batangas in 1900 during the Philippine-American War. We skip the story of Company F whose logs were short and uninformative and move on instead with Company G.
The company was under the command of Captain George W. Biegler of Terre Haute, Indiana. Next in command was 1st Lieutenant George H. Wood of Dayton, Ohio. The company’s third officer was 2nd Lieutenant Anton H. Schroeter, listed as from Manila, Philippines, so he might have been born to an American family living in the Philippines since the Spanish colonial era. On the 6th of March 1900, the battalion moved from Naic to Magallanes on its way to Nasugbu, which was reached two days later after “difficult travelling through the passes and ravines of the Alfonso range of mountains, a distance of 35 miles (56.3 km).” The entire battalion pitched camp at the town plaza. 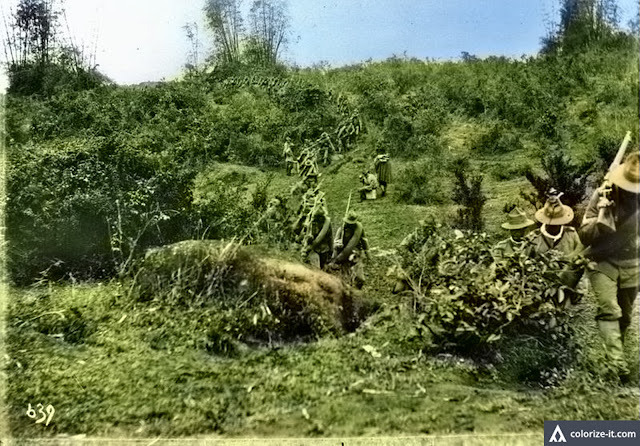 While in Nasugbu, Company G “participated in many scouting expeditions, resulting in the capture of arms, ammunition and a large number of prisoners.” These reconnaissance missions were either day trips or bivouacs that took the company’s troops to Lian, Balayan, Tuy and even back to some barrios of Alfonso2. Along with Companies E and F, it left Nasugbu on the 20th of April to join Company H, which had left a few days earlier, in Balayan. The latter would be the company’s base until the 28th of October. A detachment of some 30 soldiers, however, under the command of Lt. Wood, would remain in Nasugbu. From both Nasugbu and Balayan, troops of Company G continued to participate in reconnaissance missions, some of which led to skirmishes with Filipino “insurgents.” One of these, while soldiers of Company G were on an expedition to Nasugbu presumably from Balayan, led to the capture of one Lieutenant Colonel Pablo Borbon of the Filipino revolutionary army. This item is a bit of a curiosity. The Company G logs felt that the capture of Borbon was significant enough to be included; but regrettably did not say anything else about him. The name Pablo Borbon ought to be familiar enough to contemporary readers because one of Batangas’ largest universities was at one time named after a former governor of the province of the same name3. There is a dearth of materials over the Internet about this particular former governor. However, a personal blog4 by an apparent member of the Borbon clan, transcribing the contents of a handwritten document about the subject, confirms that the Pablo Borbon captured by Company G and the former Batangas governor were, in fact, one and the same person. According to this document, Borbon was born in 1874 and was educated at the Ateneo de Manila and Colegio San Juan de Letran. In 1898, just before the outbreak of the Philippine-American War, he would obtain a Licentiate in Law from the University of Santo Tomas. Borbon would, the document continued, serve in as an Lieutenant Colonel in the Philippine Revolutionary Forces and, presumably after his capture, spend time in prison at Fort Santiago. Not only would Borbon serve in public office as Governor of Batangas from 1910-1916, he was also Municipal Councilor of the then-town of Lipa from 1900–1901. He would also be elected as representative to Congress of the Second District of Batangas. Meanwhile, after Borbon’s capture, soldiers of Company G continued to participate in routine reconnaissance missions of western Batangas, occasionally getting involved in skirmishes with Filipino “insurgents.” The most severe of these was when a detachment from the company encountered Filipino revolutionary forces near Barrio Looc in Nasugbu on the 21st of October. Captain Biegler, the company commander, was wounded along with Privates Frank E. Mekailek of Shenandoah Pennsylvania and Fred M. Hunter of Cerede, West Virginia. Unable to return to Balayan, the detachment stayed at Nasugbu until relieved the following day by a group of 15 men under the command of 1st Lieutenant Harry A. Porter and 2nd Lieutenant C. Rodman Jones. Company G’s stint in Batangas came to an end on the 28th of October when its troops were ordered to board the steamer Petrach to sail for Manila. For the next month, the company would be stationed at Los Baños in Laguna before being deployed late in November in Mindanao. 1 Most of the details of this article has been taken from “History of the 28th Regiment Infantry, United States Volunteers, from Organization to Muster-Out, with Roster and Records of Events by Companies,” compiled by W. B. Conner, published in San Francisco in 1901, online at Hathitrust. 2 The Company G logs mentioned several barrios all spelled as the Americans heard their names: Catatinga (probably Kaytitinga in Alfonso); Bayudbud (there is a modern day barrio of the same name in Tuy); and obscure barrios about which the author can find no references to over the Internet such as Tucolin, Calany and Cailunga. 3 “Governor of Batangas,” Wikipedia. 4 “Random Threads IRL,” published 2017, online at Blogger.com.